Greenville’s Noah Walker (13) was guarded heavily by Troy’s Austin Stanaford, but still scored 22 points in the game. However, the Trojans won the Greater Western Ohio Conference contest, 71-43. 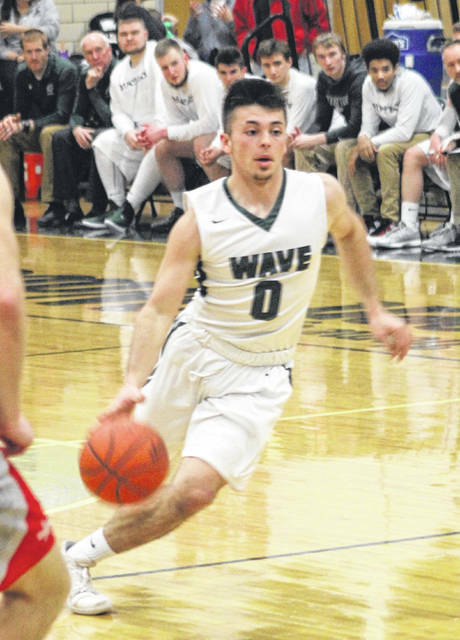 Greenville’s Noah Walker puts up a shot during the second half of the Wave’s home game against Troy. Walker had a game-high 22 points, but the Trojans won the game, 71-43. Greenville’s Reed Hanes brings the ball across the half-court line with Troy’s Caleb Fogarty on defense. The Trojans won the Greater Western Ohio Conference battle, 71-43. 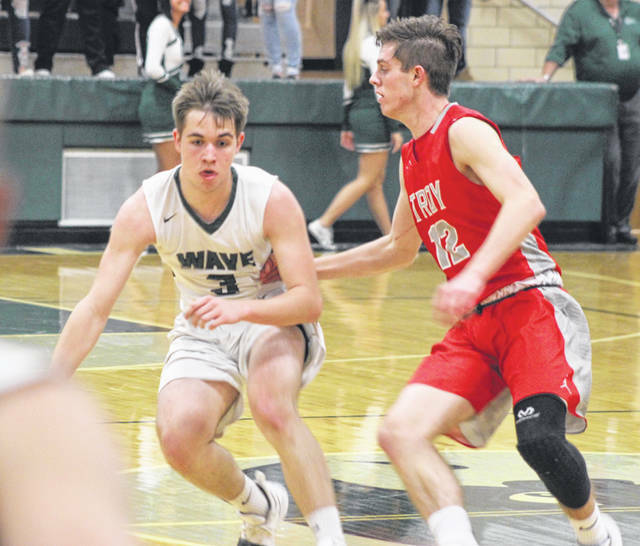 The Greenville varsity cheerleaders showed their support of the Green Wave basketball team during a Greater Western Ohio Conference home game with Troy on Tuesday. The Trojans won the game, 71-43. 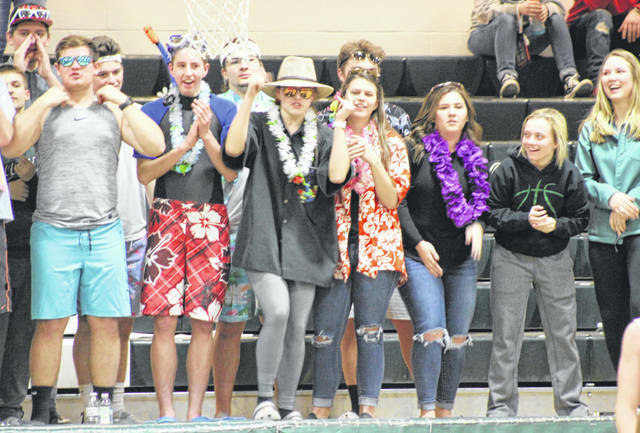 The Greenville student section showed its support of the Green Wave basketball team during a Greater Western Ohio Conference home game with Troy on Tuesday. The Trojans won the game, 71-43. 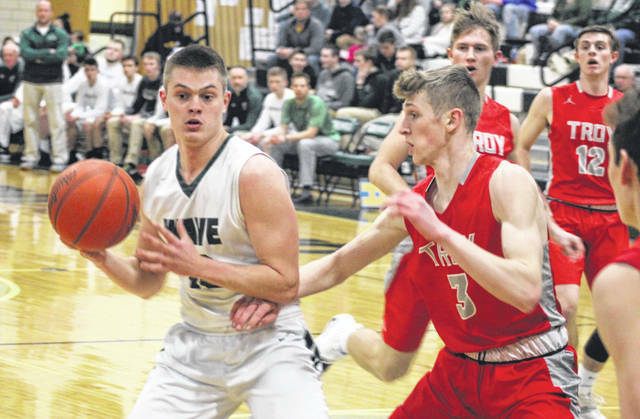 Greenville’s Ethan Saylor makes his move toward the basket during a Greater Western Ohio Conference home game with Troy on Tuesday. The Trojans won the game, 71-43. Greenville’s Foster Cole looks to go up strong to the basket during a Greater Western Ohio Conference home game with Troy on Tuesday. The Trojans won the game, 71-43. 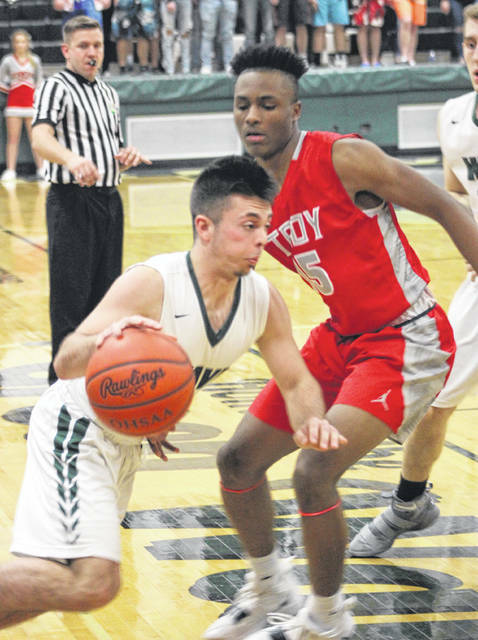 GREENVILLE – Troy’s 10-0 run to open the game set the tone for a Greater Western Ohio Conference battle at Greenville on Tuesday. Chris DeMeo, playing in just is fourth game since returning, scored 7 of those 10 points in the first three-plus minutes of the game and had 15 at halftime as Troy rolled to a 71-43 win over the Green Wave. One of those weak areas is finishing in the fourth quarter, according to Joseph. 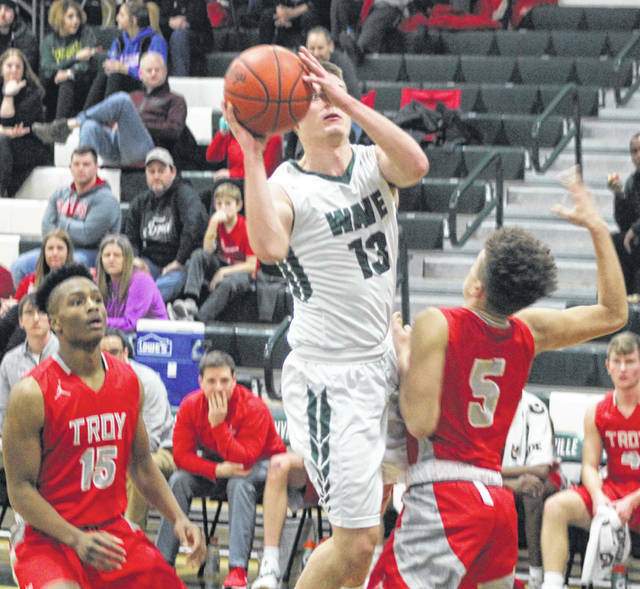 Greenville was in close range to Troy entering the fourth quarter down by 12 (49-37), but the Trojans exploded for their biggest point quarter of the night with 22 to 9 for the Green Wave to seal the win. For Paul Bremigan’s team, it has been a mixture of players this season as some who missed the first half of the year as just returning – like DeMeo. “We’ve had some guys that have been out all year and are just coming back, so just like I told Coach Joseph it is like November to us because we have some new guys we are trying to work in with only a few practices to do it,” Bremigan said. “We are trying to get done what we have to do and still play games. If we can get them together to mold as a team and really put it all on the line for the team I think we will be all right, but tonight I felt like the first half we didn’t take advantage of our opportunities enough. It felt like we played well enough to be ahead a little bit more, but they were making their free throws and you know they didn’t shoot very many times but they were like 6-of-13 and we were something like 13-of-31 with a bunch of missed free throws and that’s not a good recipe for playing on the road. Monroe was the leading scorer for Troy with 21 points followed by DeMeo with 19 and Fogarty with 15. Troy also drained 11 3-pointers in the game – three each by Monroe, DeMeo and Fogarty with one each from Brayden Siler and Tre’Vone Archie. Greenville senior captain Noah Walker led all players in the game with 22 points. He had three triples and went 5-of-9 at the free throw line. Tyler Beyke and Foster Cole each added 7 points in the loss. 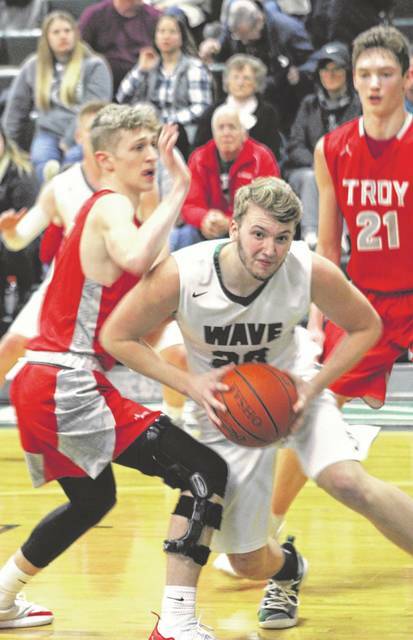 Greenville cut Troy’s lead to as little as 8 points in the second half (40-32), but could get no closer as the teams traded baskets for a while before the Trojans pulled away in the fourth quarter. With the win, Troy improved to 6-10 overall and 5-6 in the GWOC North, while Greenville fell to 0-15 and 0-11 in the conference. Both teams will play road games on Friday with Troy at Sidney and Greenville at Vandalia Butler. Troy – Austin Stanaford 1 0 2, Brayden Siler 1 0 3, Jaden Owens 1 0 2, Tre’Vone Archie 2 0 5, Caleb Fogarty 6 0 15, Caillou Monroe 7 4 21, Chris DeMeo 7 2 19, Sam Shaneyfelt 1 0 2, Andrew Holley 1 0 2. Totals: 27 6 71. Greenville – Reed Hanes 0 1 1, Tyler Beyke 1 5 7, Noah Walker 7 5 22, Jordan Dill 1 1 3, Foster Cole 2 3 7, Nolan Curtis 1 0 3. Totals: 12 15 43. 3-pointers – Troy 11 (Fogarty 3, Monroe 3, DeMeo 3, Siler 1, Archie 1), Greenville 4 (Walker 3, Curtis 1). Records: Troy (6-10, 5-6 GWOC North), Greenville (0-15, 0-11 GWOC North).